Bars and slices are so much easier to pack and transport than taller cakes. 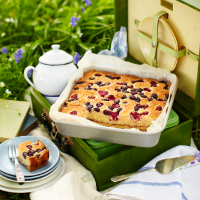 Cut this cake into squares, wrap the tin well and you’re good to go. These are especially good with a dollop of clotted cream, if you fancy. 1. Lightly grease a 23cm square cake tin and line with baking parchment. For the base, put the flour, butter and salt into a food processor and pulse to fine crumbs, then pulse in the coconut and sugar. Beat the egg yolk with the vanilla and 1 tbsp cold water, then add to the machine with the motor running, to make a soft dough. Roughly press into the prepared tin with your hands, dust with a little flour and press with the back of a spoon to push into the corners and flatten. Prick with a fork, then chill for 10 minutes. Meanwhile, preheat the oven to 200 ̊C, gas mark 6. 2. Bake the biscuit base for 15 minutes, or until pale golden. Cool for a couple of minutes, then spread with the jam. Lower the oven temperature to 180 ̊C, gas mark 4. 3. For the cake, melt the butter in a pan, then take off the heat and use a fork to beat in the yogurt, then the eggs and reserved egg white. Sift the flour, salt and baking powder into a large bowl; stir in the sugar and coconut. 4. Pour the wet cake ingredients into the dry, and mix well with a spatula. Pour over the jammy base, level the top, then scatter with the berries. Bake for 45-50 minutes, until golden and risen all over; a skewer inserted into the middle should come out clean. Cool in the tin, then cut into bars.